Pravin Gordhan throws down the gauntlet against the politically powerful family. By Susan Comrie, Stefaans Brümmer and Sam Sole for AMABHUNGANE. In an explosive affidavit, finance minister Pravin Gordhan has revealed how R6.8-billion in “suspicious and unusual transactions” may have contributed to the decision by South Africa’s major banks to close accounts associated with the Gupta family. 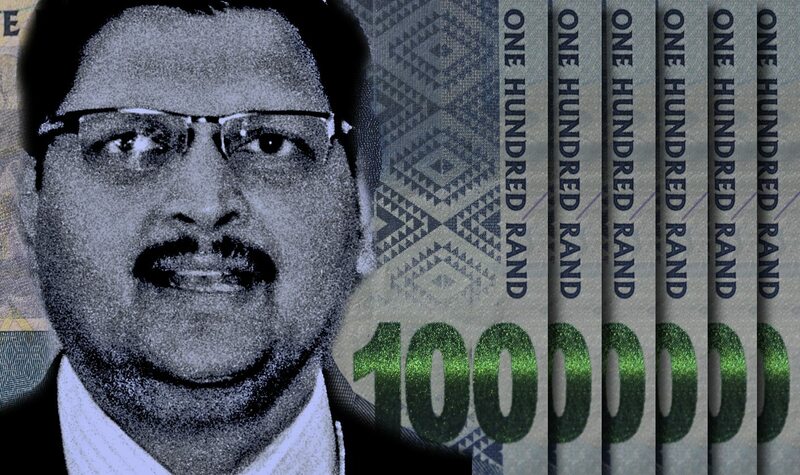 The payments – made by the Gupta family and their companies over the past four years – are listed in a Financial Intelligence Centre (FIC) report, attached to court papers filed on Friday afternoon in the Gauteng division of the High Court in Pretoria. Gordhan, who is the sole applicant in the case, is asking the court for an order declaring that he cannot interfere with the banks’ decision to drop the Guptas. Gordhan has been under pressure to intervene, both from Gupta representatives and from within government. Cabinet included Gordhan in an inter-ministerial committee tasked to engage with the banks, which he has evidently boycotted. Though in form Gordhan’s application is an attempt to get those who are pressuring him off his back, it appears an additional motive is to force information about the Guptas’ financial probity into the public domain – an escalation in the battle between pro- and anti-Gupta forces in government. In his founding affidavit, Gordhan effectively challenges the banks to produce — in open court – classified reports that they made to the FIC, which monitors suspicious transactions to combat money laundering. Gordhan cited the banks as respondents alongside Gupta holding company Oakbay Investments and 13 associated companies. Gordhan states that “it is open to Oakbay” to require that the banks submit to court the full reports they made to the FIC, to “confirm whether there is any substance to the serious contentions advanced by Oakbay that the banks have acted improperly in closing the accounts. To date, the banks – Absa, Standard Bank, FNB and Nedbank – have refused to state publicly why they terminated their banking relationship with the Guptas, citing client confidentiality. The Gupta companies and their executives have claimed that they are the victims of an “anti-competitive and politically-motivated campaign” and that the banks have provided “no justification whatsoever” for closing their accounts. Correspondence attached to Gordhan’s application shows that between April and September, Oakbay CEO Nazeem Howa fired off repeated letters seeking to persuade Gordhan to influence the banks to reopen their accounts. Howa told Gordhan that the banks had given no reason for closing the accounts. But in an interview in June with Carte Blanche, he read from a letter received from Standard Bank. In it, Standard Bank cited laws, including the Prevention of Organised Crime Act, the Prevention and Combatting of Corrupt Activities Act, the US Foreign Corrupt Practices Act and the UK Bribery Act, that it said it risked contravening should it continue doing business with the Guptas. At the end of July, Gordhan wrote to both the FIC and the registrar of banks at the South African Reserve Bank, asking if there was any evidence they could legally share that would indicate the banks were right to be concerned about the Guptas’ financial dealings. In response, FIC director Murray Michell compiled a report listing financial transactions by Gupta family members and entities that banks had reported to the FIC. The list includes 52 transactions ranging from R5,000 to R1.37-billion, and totaling R6.8-billion. It also includes 20 “multiple transactions” for which no amounts are given. Michell wrote that the legislation did not permit him to give details of the banks’ reports, but referred to the possibility of them being submitted to court. His report gave an indication, however, of the serious light in which the banks appear to have regarded the transactions. He says they were reported under section 29 of the FIC Act – which deals with transactions that are deemed to be “suspicious and unusual”, such as transactions reasonably suspected to involve tax evasion, money laundering or financing of terrorist activity. Included in the red-flagged transactions is a R1.34-billion transfer from the Optimum Mine Rehabilitation Trust, two R38-million transactions by Atul Gupta on consecutive days in February 2014, and a R10 million transaction by Mabengela Investments, which is jointly owned by Duduzane Zuma and the Guptas. Separately, registrar of banks Kuben Naidoo wrote to Gordhan that Standard Bank informed the Reserve Bank’s financial surveillance department about “a particular foreign exchange transaction involving VR Laser Asia, an associated company of Oakbay, which could form the basis of an exchange control related investigation by that department”. Naidoo gave no further details. The correspondence attached to Gordhan’s affidavit also gives insight into a behind-the-scenes tug-of-war over the inter-ministerial committee that cabinet appointed in April to “engage” with the banks on the Guptas’ behalf. The committee was led by Mineral Resources Minister Mosebenzi Zwane, a Gupta acolyte, but included a clearly reticent Gordhan. Gordhan, his affidavit shows, sought legal advice on whether there was any legal basis for him as finance minister to intervene with the banks. A resulting legal opinion, from advocates Jeremy Gauntlett and Frank Pelser, warned that not only was there no legal way he could intervene, but that the planned meeting between ministers and the banks could have “unintended consequences” and create “adverse perceptions” about political interference in the banking sector. When the scheduled meeting between the ministerial committee and at least one of the banks went ahead in early May, Gordhan did not attend. By August, Gordhan appears to have run out of patience. Gordhan told Howa that he would meet with him, but only after he had been given the correspondence from the banks. Still Howa kept pushing for a meeting. Instead it is Gordhan who has now started colouring the picture in public – and it’s not pretty. We are an independent, non-profit investigative journalism centre. Like this story? Be an amaB supporter. Sign up for our newsletter. Visit us at amaBhungane.co.za.